I don't like having my picture taken, but I had promised to share the new haircut. I was trying my best to use the timer on my new camera, but I couldn't seem to move quick enough and couldn't figure out how to change the amount of seconds on the timer. Thus, the blurry photo. Believe it or not I had about 6 inches cut off and had my hair layered. Most people don't even notice that I've cut my hair. While playing around with my new Canon Rebel T3i, I took this photo of my son and really like how the light from his new Nook Tablet was shining on his face. I'm excited to try photographing my artwork with it soon. 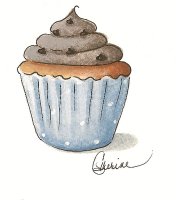 Seven of my cupcake prints are hanging on the wall in the bakery section of the store. Wishing each of you a wonderful blessed 2012! the joy and hope, are your faithful companions along this year. All the best in 2012, Cathie! I love your hair style. It frames your face beautifully! How fun is that, a new camera and your lovely art in a highly visible spot. Wow! What a great idea for a bakery to use your beautiful cupcakes. I loved seeing that. And I love seeing you! Your hair looks beautiful and it is very stylish. Great job! Guess that you and your hairdresser were on the same page for sure! 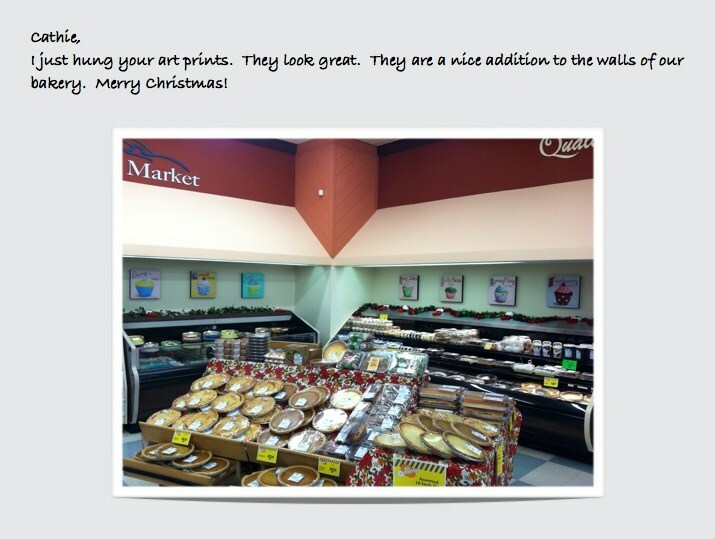 That is awesome that Bakery used your cupcake painting for their store!! Happy New Year! Your cupcakes look perfect in the bakery! What a cute idea! And you're going to love your Rebel! That was my first digital camera, and they're a lot of fun! of my new- years giveaway. You are heartily invited to join it if you want to. Your paintings look georgous in this bakery. Could there a better place for them? Congratulations on the sale of your cupcake pictures to the Bakery/Deli. They do lool nice hanging there!1 Also Congratulations on your new Camera. Every once in awhile I get a picture with that warm glow, but i never know what i did to get it for next time! from Marlynne mcreatesdaily.blogspot.com. Congratulations! How exciting for you to have your art displayed. Your hair is beautiful. I don't know how to use the timer on my camera at all so kudos to you for at least knowing how to use it! Enjoy! Well, I love your hair and I love your paintings. I am a wanna be fok artist and just dream of being as good as you! I hope 2012 is very good to you! I'm sorry, but I must correct my typo. Folk artist. So sorry about that. I am a little compulsive about things like that. Anyhow . . . I can't wait to see what else you have in store for us - you do such lovely work! My girls loved their coffee shop prints so much, they now have friends that want them. Gary and I framed them along with the cupcake prints for Christmas. They were really surprised! Love your new haircut ~I like the layering. 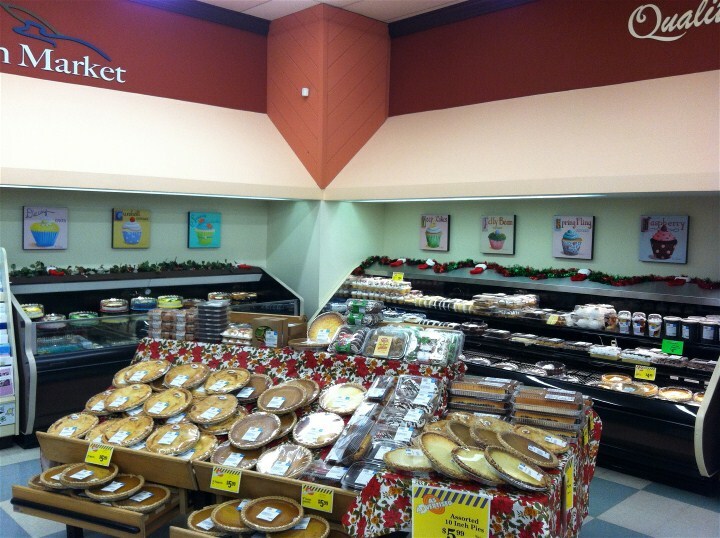 How wonderful to have your paintings all lined up so pretty in the bake shop!